• Sole' (so-lay) is Sun in Italian, let the sun shine on a beautiful new you! • Regain confidence in your Beauty! • Re-create top Volume in 100% Remy Hair, at an amazing price! Remy Hair is the highest quality of real hair available, with all cuticles intact and unidirectional. Remy Hair blends perfectly with your own hair for a completely natural look. 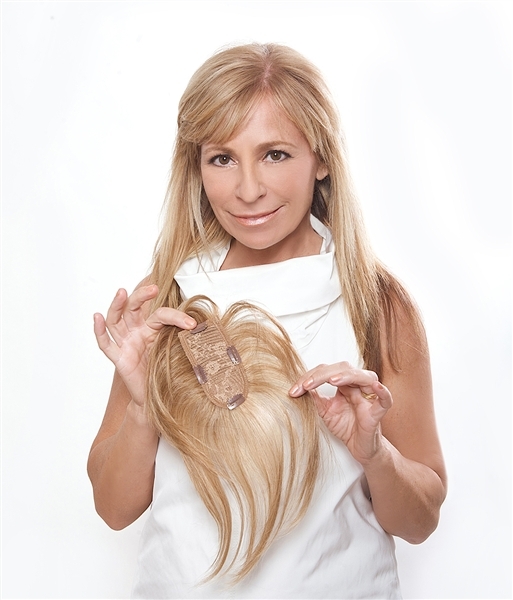 Our 100% Remy hair extension can be washed, cut, color-treated and styled, just like your hair! • QUALITY - The highest quality natural human hair available. • AFFORDABLE - Direct from the designer manufacturer, to deliver celebrity products at affordable pricing. Washing and Drying Be sure to remove extension prior to washing. Care for your Sole' Top as you would your own hair by using quality shampoo and conditioner. The Sole' Top should not be washed daily, just when needed. If it becomes dry, use high quality nutritional oil for hair. After you wash, you may restyle your Sole' Top using high quality straighteners, curling irons, or brush and blow dryer. The Sole' Top utilizes special coated micro- ‐clips and silicone strip to ensure No Damage wearability. The Sole' Top can be styled while you wear it, or before putting it on. It can be curled and straightened just like your own hair, and if you use hair spray be sure to use nutritional oil after you wash it. If you would like a layered look or shorter style with your Sole' Top, we recommend your consult your stylist to achieve the look you desire. Easy apply to clean hair by opening the clips and laying the Sole flat on the top of the head, then gently pressing clips closed onto the existing hair.